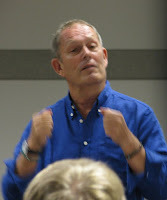 David Savage, British designer and furniture maker, gave a seminar at the Black & Decker University in Maryland today. B & D hosted the free event, where we attendees gave opinions on prototypes, test drove tools, ate pizza, won giveaway items (I won a 17-piece drill bit set) and heard some engaging presentations. Speed + Skill = Craftsmanship. 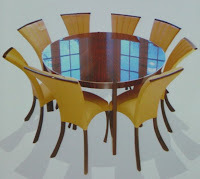 He also believe s designs should be understated—that details should be discovered, not blatantly obvious. His is a shop with several craftsmen, some teaching and some being taught, and all making one-of-a-kind projects. If David needs to build a small production run, they construct a prototype and one final piece in the shop and then enlist the help of nearby workshops, with whom David has a close relationship, to make the remaining pieces in the order. As you might notice in his designs, David likes movement—fluid, lively, rhythmic, "calligraphic" motion. 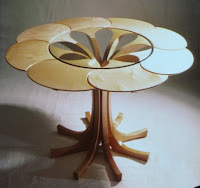 He also uses nature as inspiration, as shown in two of his tables: one that resembles petals on a flower and the other resembling a sunflower, with the chairs representing the petals. 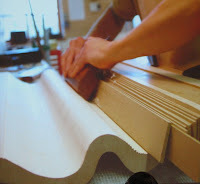 The second photo shows how one of the apprentices shaped a wavy table apron. By using shims as fences for the rounding plane, he was able to control the path of his cuts. 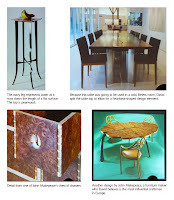 David loves to meet with his clients, preferably in their homes, where he can see where the piece will be used. This way, he ensures that the furniture fits perfectly in its final environment, complements surrounding pieces, and interacts with light sources. 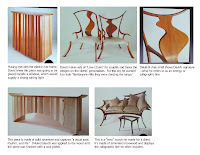 He discovered that clients would rather view his pencil sketches when he presents designs rather than computer-generated ones, which they view as too mechanical. Sketches, they say, represent craftsmanship. 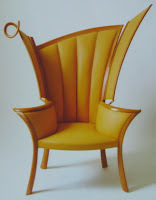 David said that sycamore, ash, cherry, oak (on its way back into popularity), and yew and walnut (both difficult to acquire), are common species used in British-made furniture. He relies mainly on polished shellac or oil and wax fo r finishing. However, he also uses a technique called a "scrubbed" finish where hot water, bleach, and a bit of soap are used with a heavy bristle brush to scrub the tannins away from the wood, leaving a pale-colored, lightly-textured surface. David showed us slides of work from other British furniture designers/makers, including John Makepeace, who he believes is the most influential craftsman in Europe. It was enlightening to see how things are made "across the pond" and I was delighted to witness a friend from my woodworking club, an insufferable heckler, being put in his place by our speaker. Good on ya, David! You can view much better photos of David's work on his site. The above shots were taken of the slides he presented, so are not the best quality.